If you eat, you're an investor. - Credibles: crowdfunding and gift cards for local food businesses. Enjoy a prepaid Credibles tab. August 15, 2014 by arnohesse. How Credibles brings investments in food businesses down to earth. 1. 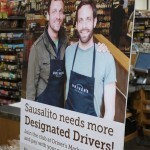 Customers pay for food purchases in advance. Businesses pay back the edible loans in goods and services. 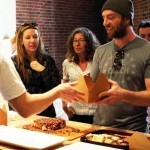 “The concept is simple: Customers prepay for food and receive edible credits to use like a gift card. Large prepayments can even earn edible interest. In the meantime, food businesses get the money they need to grow.” – Yes Magazine. Local businesses essentially borrow funds from their customer community, instead from financial institutions. In its first year, Credibles has engaged with 100 food businesses. Successful fundings range from $20,000 to over $100,000. Pre-payments per customer average in the $300-$400 range, with many customers coming back for a “refill” once they have “eaten” their initial credits. Instead of repaying a bank loan with cash from sales, edible credits are paid back with products they can grow or cook themselves. (Can money be any slower?) Since the re-payments are at Cost Of Goods Sold, the economics are far more favorable for the businesses than cash, allowing them to throw in bonus credits as rewards. 2. Through Credibles, investing in your local food systems is accessible to everyone. No longer are investments in the local economy only for angel investors or affluent philanthropists. 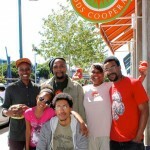 New investment vehicles like Direct Public Offering allowed enterprises like People Community Market in West Oakland to lower the entry level to $1000. With Credibles, they were able to offer their community members to take a stake in their venture with amounts as low as $50. Through the daily act of food buying and eating, all people can direct capital flows into their community and the businesses they want to see flourish. It’s Community Underwriting in action. 3. 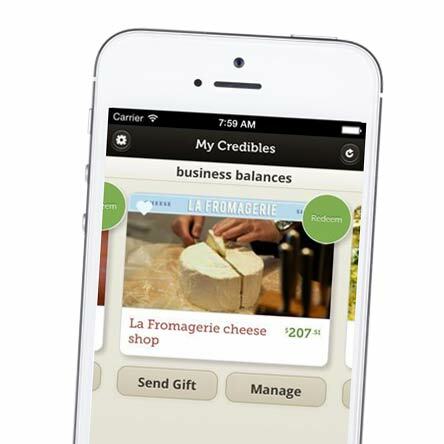 With the Credibles apps for businesses and customers, edible credits have become a daily affair. “A seamless and pleasant experience. How ideal it would be to do all my food shopping like this.” – Gianna Banducci, Portland OR. 4. Prepayments strengthen the relationship between food businesses and their customers. At many participating businesses, 50 to 100 customers have “opened a tab” with Credibles. Early reports show that the businesses see the Credibles customers more often after they invest with Credibles, often 1.5x – 2x! With the Credibles app, the staff learns the names of the regulars. After they have “eaten their credits”, most customers come back for another funding. Driver’s Market, an all organic and non-GMO grocery in Sausalito, CA, calls their pre-paying investors “Designated Drivers”. Many of them already have had five or more “refills” of Credibles. The connection is about more than money. For significant pre-payments, Flying Fish in Portland, has promised the funders to take them out on one of the Albacore fishing trips. 5. 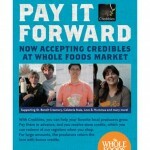 At Whole Foods Northern California, Credibles is moving the money up the food chain, literally. 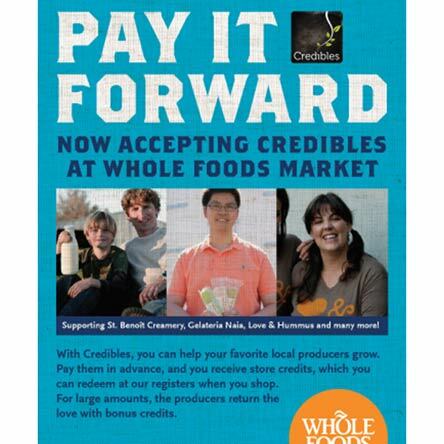 As part of its commitment to “local”, Whole Foods Market in Northern California has started to accept Credibles as a form of payment at the cash register of all 40 stores. The prepaid funds move up the food chain, directly to the local producers (not to Whole Foods). Foodmakers like Saint Benoit Creamery or Farmhouse Culture receive working capital for their ingredients and equipment, well in advance before the customers purchase their products. Redeeming local investments at the grocery checkout is a milestone for bringing money down to earth. Now that edible credits have been proven as a successful model, Credibles is now actively building community capital in selected markets across the U.S., connecting local businesses and their customers, and making edible credits cross-redeemable between local businesses.